Chen Long of China hits a shot against Khosit Phetpradab of Thailand during their second-round match at the badminton world championships in Nanjing, capital of east China's Jiangsu Province, yesterday. The Olympic champion won 21-16, 21-11. Viktor Axelsen of Danmark and Nozomi Okuhara of Japan stayed on their course for the back-to-back men's and women's singles titles in the BWF World Championships, as both of them claimed straight-game wins here on Wednesday to storm into the third round of the competition. World No.1 Viktor Axelsen defeated China's Huang Yuxiang 21-17, 21-8 in a match which interrupted by drops of water from the roof for over 10 minutes. The organizing committee explained later that it was the condensed water which collected because of the temperature difference in and out of the arena. The unexpected incident happened in the first game when the duel tied at 16-16, and Huang has just managed a strong fight-back, winning five consecutive points to level the game. "I was not prepared for the unexpected incident on the court. 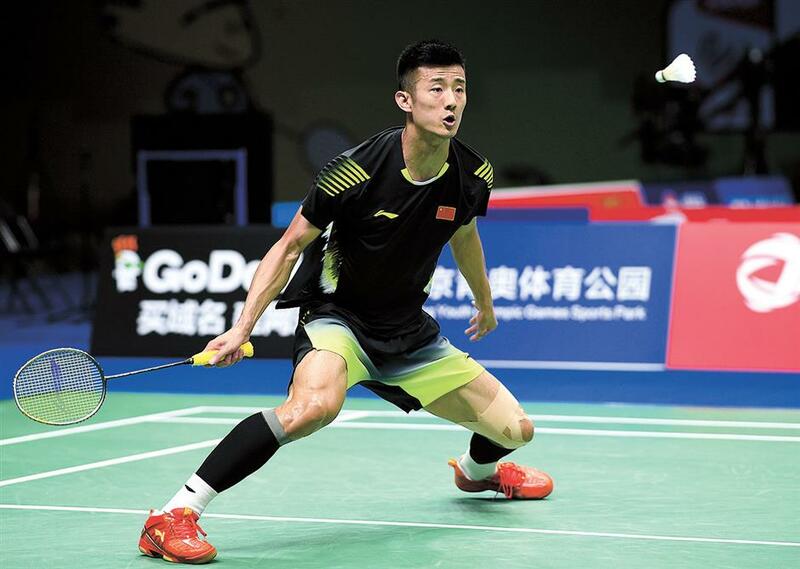 He went into the game much better after the break, I didn't get used to the new court as quickly as he did," Huang said. The home player only won nine points after the resumption, one in the first game and eight in the second. China's world no.3 Shi Yuqi outclassed England's Rajiv Ouseph 21-18, 21-9 to earn himself a chance to take on compatriot Lin Dan for a place in the quarterfinals, the latter dispatched Verma Sameer of India 21-17, 21-14. Shi was proactive from the very beginning of the match, starting with a 4-1 lead. But Ouseph proved a stern test for the no.3 seed with his sharp shots, chasing closely behind. The Englishman nearly drew level at 19-18 down, but gave away the first game with two subsequent errors. Shi didn't give Ouseph many chances in the second game as he led from start to finish and concluded the match with a hammer from the backcourt. "It was not an easy win for me," Shi said afterwards. "He gave me quite a few tough challenges." Shi has won both his encounters with five-time title winner Lin this year, in the final at the All England Open and the final of the Malaysia Open, and has a 4-1 overall head-to-head advantage. But the 22-year-old was humble when asked about the duel. "It's unavoidable as we were drawn into the same quarter. I will take it as a challenge," Shi said. Elsewhere, Japanese poster boy Momota claimed an easy win over Wraber of Austria, whose world ranking is 99 places below that of the title favorite. Rio Olympic champion Chen Long knocked out Khosit Phetpradab 21-16, 21-11. In the women's singles actions, eighth-seeded and title holder Okura needed only 28 minutes to secure a berth in the third round, after eliminating unseeded Rachel Honderich of Canada 21-11, 21-9. The 23-year-old Japanese star will play Goh Jin Wei of Malaysia in the round of 16. The latter knocked out another Japanese player, 14th seed Aya Ohori to advance. China's highest-ranked women's singles player Chen Yufei will take on compatriot Chen Xiaoxin in the third round. The two beat Cheung Ngan Yi of Hong Kong and Indonesia's Gregoria Mariska Tunjung respectively in the second round. Chen Yufei was defeated by Cheung in their last encounter at the Indonesia Open in 2017 but this time Chen was able to exact a sweet revenge, claiming a 21-17, 22-20 victory in 44 minutes. "I think I'm better prepared today, mentally and technically, and this makes me more confident," Chen Yufei said afterwards. Young talent Chen Xiaoxin clinched a riveting 21-19, 21-14 win over no.16 seed Gregoria Mariska Tunjung. The 20-year-old bounced back from 10-5 down in the first game and dominated the second to move into the next round.